Lot of advancement has taken place, not only in the management but also in the pathophysiology and imaging modalities in patients of stroke. Indolent chronic infections, particularly those due to H. pylori, have been identified as one of the risk factors. The mechanism of inflammation in inducing a precoagulant state has also been worked out. SPECT studies have detected ischaemic areas before appearance of CT abnormalities. CT angiography identifies abnormalities in the 'circle of willis' in posterior circulation strokes much better, and helps weigh the risk versus benefit of thrombolysis. With experiance in use of r-TPA, the list of contra indications and precautions has become longer than its indications. Newer drugs like lubeluzole and edselen have also been recommended. Various other drugs e.g. aptiganel hydrochloride, MDL 28170, 'basic fibroblast growth factor' and 'superoxide dismutase' are at an experimental stage. The concept of a 'stroke cocktail' may be in vogue soon. Controversies still exit regarding the exact indication of prophylactic anticoagulant and the 'international normalized ratio' (INR) to be achieved. Guidelines have been laid down for the approach to patients with asymptomatic carotid artery stenosis. However, the paramount message in stroke care is dissipation of the concept of 'brain attack', amongst the primary care medical and para-medical personnel. The light and electronmicroscopic changes are described in two cases of medullomyoblastoma, and compared with the changes seen in a case of foetal rhabdomyoma. The medullomyoblastomas in two children aged 8 and 5 years, consisted predominantly of classical type of medulloblastoma cells, along with few to many 'strap cells' or 'myoid cells' which, on closer examination, showed clear cross striations, consistent with muscle fibres or myofibrils. The primitive myoid cells were similar to those encountered in larger numbers in a post-auricular rhabdomyoma, possibly of foetal origin in a 40 day old infant. The four pathogenetic mechanisms i.e. (i) an embryonal stage of myofibrillar differentiation; (ii) a malformative factor; (iii) a teratoid factor on account of the presence of mesenchyme derived striated muscle tissue in the obviously predominant ectodermal medulloblastoma; and (iv) metaplasia of the vascular smooth muscle cells in the medullomyoblastoma, are discussed. With the incidence of patients infected with human immuno-deficiency virus (HIV) increasing in India, the central nervous system (CNS) manifestations of the disease will be seen more frequently. The CNS may be primarily afflicted by the virus or by opportunistic infections and neoplasms secondary to the immune suppression caused by the virus. In India, although mycobacterium tuberculosis has been reported to be the most common opportunistic infection, toxoplasmosis may become as common owing to the ubiquitous nature of the protozoan. Since an empirical trial of medical therapy without histopathological diagnosis is recommended, the true incidence of this condition may remain under estimated. The role of ancillary tests such as radiology and serology in the initial diagnosis of this condition remain crucial. This report highlights two patients who were diagnosed to have acquired immuno-deficiency syndrome (AIDS) only after the biopsy of the intracranial lesion was reported as toxoplasmosis. Presently all patients for elective neurosurgery are tested for HIV antigen. The management protocol to be followed in a known patient with AIDS presenting with CNS symptoms is discussed in detail. The value of ancillary tests is also reviewed. The surgical outcome of 74 patients, who underwent transoral decompression (TOD) for ventral irreducible craniovertebral junction anomalies between January 1989 to September 1997, was studied to evaluate the perioperative complications and problems encountered. The indications for TOD included irreducible atlantoaxial dislocation (n=24), basilar invagination (n=16), and a combination of both (n=35). Following TOD, occipitocervical stabilization using Jain's technique was carried out in 50 (67.5%) and atlantoaxial fusion using Brooks' construct in 18 (24.3%) patients. The pre- and postoperative radiology was compared to assess the adequacy of decompression and stability. The major morbidity included pharyngeal wound sepsis leading to dehiscence (20.3%) and haemorrhage (4%), valopharyngeal insufficiency (8.1%), CSF leak (6.7%) and inadequate decompression (6.7%). Neurological deterioration occurred transiently in 17 (22.9%) and was sustained in 7 (9.4%) patients. The mortality in six cases was due to operative trauma, exanguination from pharyngeal wound (one each), postoperative instability and inability to be weaned off from the ventilator (two each). Of the 47 (63.5%) patients available at follow up ranging from 3 months to 2 years, 26 (55.3%) showed improvement from their preoperative status while 14 (29.8%) demonstrated stabilization of their neurological deficits. Seven (14.9%) of them deteriorated. Though TOD is logical and effective in relieving ventral compression due to craniovertebral junction anomalies, it carries the formidable risks of instability, incomplete decompression, neurological deterioration, CSF leak, infection and palatopharyngeal dysfunction. The neuropathological features of temporal lobe epilepsy were studied utilising 100 consecutive surgical specimens from patients with medically refractory complex partial seizures. A wide spectrum of neuropathological changes was recorded in 98 specimens. Fifty-eight specimens showed features of Ammon's horn sclerosis. Diffuse accumulation of corpora amylacea were demonstrated in the resected temporal lobes from 54 patients. Six patients had neoplastic lesions of temporal lobe. One unique case of dysembryoplastic neuroepithelial tumour showed a melanotic component within the tumour. The neuropathological features were regarded as nonspecific in 31% of cases. Our results indicate that a majority of patients with medically intractable epilepsy of temporal lobe origin reveal significant neuropathological features. Careful documentation of the neuropathological features and its correlation with radiological, electrophysiological and pre- and post-surgical clinical features will help in predicting the seizure outcome after temporal lobectomy for medically refractory epilepsy. 37 cases of capsular stage of brain abscess based upon CT scan staging were treated by repeated elective aspiration through a burr hole and intracavitary application of antibiotics on alternate days, till two consecutive negative aspirations were obtained. A combination of furosemide and antibiotics in multiple doses were also given. The mortality rate was 2.7% and the morbidity rate 8.3%. Corticosteroids were not used in the management of brain abscess. Thus, repeated elective aspiration was found to be an effective mode of surgical management of brain abscess. Twenty seven patients with hemifacial spasm (HFS) and sixteen patients with blepharospasm (BS) having mean Jankovic disability rating scale score of 2.56+0.58 SD and 2.81+0.54 SD, respectively, were treated with botulinum toxin A (BTX-A) injections. The total number of injection sessions were ninety one with relief response in 98.91%. The mean improvement in function scale score was 3.78+0.64 SD and 3.29+1.07 SD respectively, in HFS and BS groups. The clinical benefit induced by botulinum toxin lasted for a mean of 4.46+3.11 SD (range 2 to 13) months in HFS group and 2.66+1.37 SD (range 1 to 6) months, in BS groups. Transient ptosis was seen in 4.39% of total ninety one injection sessions. These findings show that local botulinum toxin treatment provides effective, safe and long lasting relief of spasms. The study was aimed at finding possible factors for delay in the diagnosis of juvenile myoclonic epilepsy (JME) in a developing country. Data was analyzed retrospectively through the medical records and prospectively through a re-evaluation of the history and EEGs of patients with JME registered in a university hospital in south India. Of the 131 patients, 23 (17.5%) patients were seen by neurologists before registration in the clinic. Diagnosis of JME was established in 118 patients at the time of registration and in 13 (10%) patients during follow-up in the clinic. The mean interval between onset of disease and the diagnosis was 6.8 + 6.3 years. In 20 patients the diagnosis was established 10 years after the onset. The mean interval between the first evaluation and diagnosis was 24. 2 months in the 13 patients in whom the diagnosis was established during follow-up in the clinic. Lack of familiarity with the clinical syndrome was probably the factor for delay in the diagnosis in 108 patients seen by practising physicians. The factors for delay in the diagnosis in patients seen by neurologists included failure to ask about myoclonic jerks resulting in misinterpretation of EEGs in 28 patients, misinterpretation of absences and/or unilateral jerks in 4 patients, and failure to ask about myoclonic jerks and misinterpretation of focal EEG abnormalities in 4 patients. This study suggests that the possible factors of error in the diagnosis of JME among the neurologists were similar to the observations reported from the developed countries; whereas the factor for delay in the diagnosis of JME among practising physicians was lack of familiarity with the epileptic syndrome. 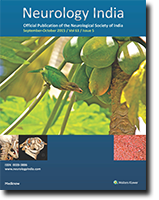 The authors present five cases of intracranial hydatid cysts managed at the department of Neurosurgery, King Edward Memorial Hospital, Mumbai, between 1984-1997. The mean age of presentation was 13.4 years. Four patients (80%) were in the first decade of life. All patients presented with focal neurological deficit and clinical features of raised intracranial pressure. Radiological investigations included computerised tomography (CT) scan in three cases, CT and magnetic resonance (MR) scan in one case and accidental cystogram in one case. Two patients had multiple intracranial cysts. One patient had a solitary cyst in the lateral ventricle. Commonest location was in the parietal lobe (3 cases). Total excision of the cyst was done in all five cases. Recurrence was seen in two cases, probably as a result of rupture of the cyst during first surgery. The features of this rare disease are retrospectively analyzed in this presentation and the literature is reviewed. Duchenne muscular dystrophy (DMD), with an incidence of one in 3500 male new borns, and its milder variant, Becker muscular dystrophy (BMD), are allelic X-linked recessive disorders, caused by mutations in the gene coding for dystrophin, a 427 kD cytoskeleton protein. There are no available molecular markers to differentiate these two. The purpose of this study was to study genetic polymorphism in muscular dystrophy and explore its potential in discriminating these two allelic forms of the disease. The results revealed unambiguously the presence of three transcripts : 598bp, 849bp and 1583bp long which are selectively expressed in the muscles afflicted with muscular dystrophy as compared to the normal muscle. 1583bp gene transcript was conspicuously present in the muscle tissues of both DMD and BMD patients whereas 598bp and 849bp long transcripts were exclusively present in DMD but not in BMD patients or normal human subjects. These gene transcripts had no sequence homology with dystrophin gene and these were also present in the families belonging to DMD and BMD patients. These results point to the fact that based upon the selective expression of these three gene transcripts, one could not only differentiate between DMD and BMD diseases at the molecular level, but also between normal and dystrophic muscle. Further, these findings also reveal that apart from dystrophin gene, these gene transcripts may also be responsible for the differential progression of DMD/BMD phenotype. 68 consecutive patients admitted with intramedullary spinal cord tumours and operated at Vellore during a six year period from January 1990 are discussed. 41 tumours were radically resected, 11 partially excised while 14 had only a biopsy. Radiation therapy was advised post operatively to those patients for whom a partial excision or biopsy was done. There was no postoperative mortality. Two patients developed wound infection and one developed postoperative hydrocephalus. Postoperative clinical assessment between four to eight weeks after surgery showed that 25 out of 68 patients improved, 29 remained unchanged, while 14 had worsening of deficits. Immediate post operative assessment, however, was less encouraging. Evaluation of these patients was done using a functional scoring system and Karnofsky rating. The follow up period ranged from 2 weeks to 64 months after discharge from hospital with a mean of 14.6 months. The indicators of radical excision were good tumour-cord interface, cranially located tumours, presence of syringomyelia and histology of ependymoma. Two patients had recurrence of tumour. Transcranial magnetic stimulation was performed in 40 subjects. Twenty patients in the age group of 3 to 8 years and having different grades of malnutrition were included in the 'study group' whereas 20 normal children having no complaints comprised the 'control group'. The coil of the magnetic stimulator was applied tangentially over the vertex to stimulate the cortex. The motor evoked potential (MEP) was obtained using root stimulation by applying the coil at the cervical and lumbosacral spines. Recordings were made from the abductor pollicis brevis (APB) and extensor digitorum brevis (EDB) muscles of both sides. Cortical threshold, latency and amplitude of motor evoked potential and central conduction time were recorded. Malnourished children showed significantly increased cortical threshold, prolonged cortical latency and central conduction time and reduction in amplitude of MEP. Observed delay in central motor conduction in malnourished children suggests asymptomatic involvement of corticospinal pathways. We report a 26 year old woman presenting with a chronic predominantly motor radiculoneuropathy. A biopsy proven solitary lytic plasmacytoma was detected in the left sixth rib. Serum immunoelectrophoresis revealed 'M' band (IgG, l light chain). Excision of the plasmacytoma resulted in gradual but steady recovery. We suggest that all patients with 'cryptogenic' polyneuropathy be investigated for this potentially treatable condition. A high index of suspicion assists the organization of appropriate diagnostic investigations. A case of an intracranial tuberculoma located within the confines of the Meckel's cave is presented. The patient was young, non-immunocompromised and otherwise in good health. The granuloma mingled with the fibres of the trigeminal nerve. The lesion mimicked a trigeminal neurinoma in its clinical presentation, preoperative investigations and intraoperative consistency and vascularity. The rarity of the location and possible mode of transmission of infection to this site is discussed. The literature on this subject is briefly reviewed.